SNES Super Metroid (JPN/USA) "100%" in 1:08:10.87 by cpadolf. In accordance with standard procedure, Samus discarded all of the items she collected on previous adventures before embarking on this one. This run aims for 100% item collection in the fastest time, and it does so 2 minutes and 34 seconds faster than the previous movie by JXQ, thanks to various new tricks, route changes, and general optimization. The in-game completion time is 36 minutes and 3 seconds. 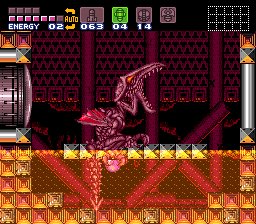 Super Metroid has a wide variety of time-saving glitches to exploit, many of which are explained on the Super Metroid Tricks page. Be sure to check it, as well as the author's comments, for more information on the improvements. If you prefer to watch the fastest completion without getting all the items, check out Super Metroid in 38:41 by Taco & Kriole.